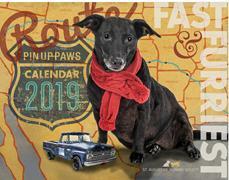 For SHIPPED Orders, please use the following PayPal button to order your 2019 Pin Up Paws calendars. Calendars will be ready to ship October 15, 2018. If you prefer to pick up your order at St. Augustine Humane Society, please follow instructions below. You will not be charged shipping and handling if you choose to pick up your calendars in person.